MK Kitchen sits in the center of Gorham and has earned a reputation for solid food and drink that stands out in its location a little outside of Portland. I was in the right mood to head out of town and into an area I visit infrequently, so we made reservations and took the drive. I had heard positive reports on the restaurant, though I didn’t have any particular intel before we visited early on a Saturday evening, so it was time to learn more about the eatery first-hand. We arrived hungry and thirsty, found a prime parking spot, and headed in to experience MK to the fullest extent possible. The restaurant was large with a small but attractive bar all the way to the left. Its two rooms were filled with many copper top tables. It looked beautiful, felt spacious, and had a calm, inviting atmosphere that gave a strong first impression. It was honestly more than I expected, but that’s one reason why I always try new restaurants – I never truly know what I’ll find. Business was slow, but we were early, so that was hardly notable. We were quickly visited by a waitress who schooled us on the menus, adding a scallop special which was available both as an app and an entree, and then offered us drinks. We told her weren’t quite ready yet, but would be soon. We took another minute or two and were prepared with drink orders when our server returned. My wife stuck with her safety drink of sauvignon blanc. I went with the MK Seasonal Manhattan – house infused peach bourbon, sweet vermouth, bitters, served up with an amerena cherry. I love peach and was taken by the idea of a Manhattan with some some of the hairy fruit in it. I couldn’t imagine it being anything other than a match made in heaven. After ordering those, we spent some time reviewing the food menu which had a substantial number of apps, soup and salads, pastas and grains, entrees, and sides. Upon delivery of our drinks, which hardly took any time at all, we ordered the food. 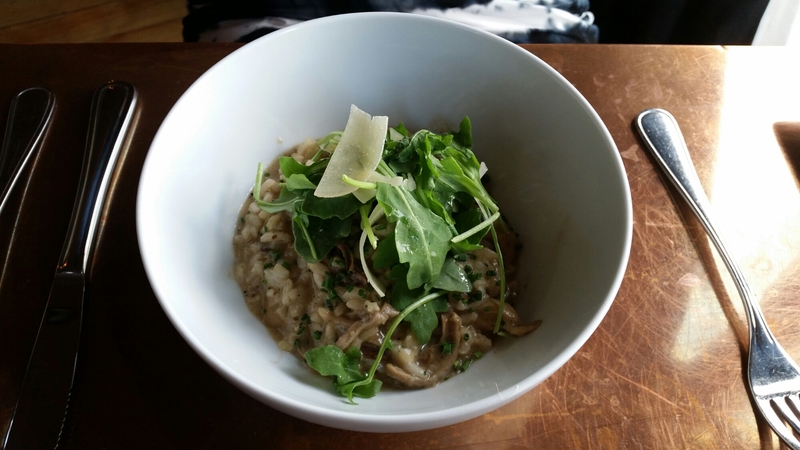 She ordered the Grilled Romaine Caesar – croutons, shaved parmesan, house made creamy garlic dressing – and a small serving of the Mushroom Risotto – roasted local mushrooms, fresh herbs, baby arugula, truffle oil, and parmesan. 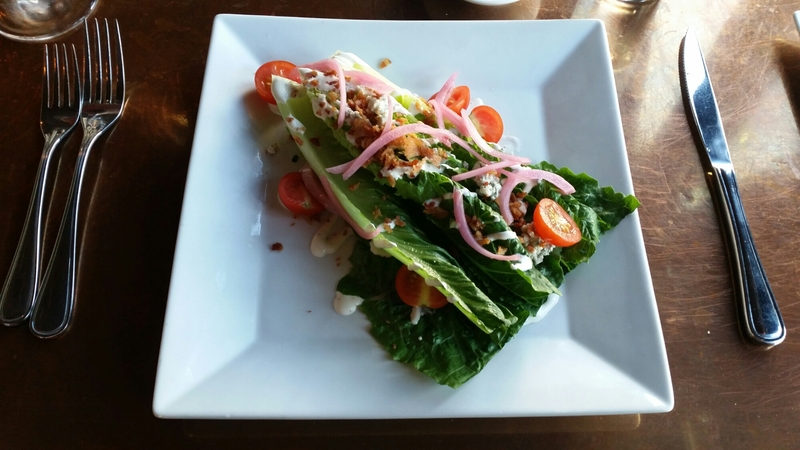 I considered an app of Lobster Cones because they sounded amazing, but eventually decided to start with the MK Wedge – romaine hearts, cherry tomatoes, bacon crumbs, blue cheese, pickled onion, and buttermilk dressing. 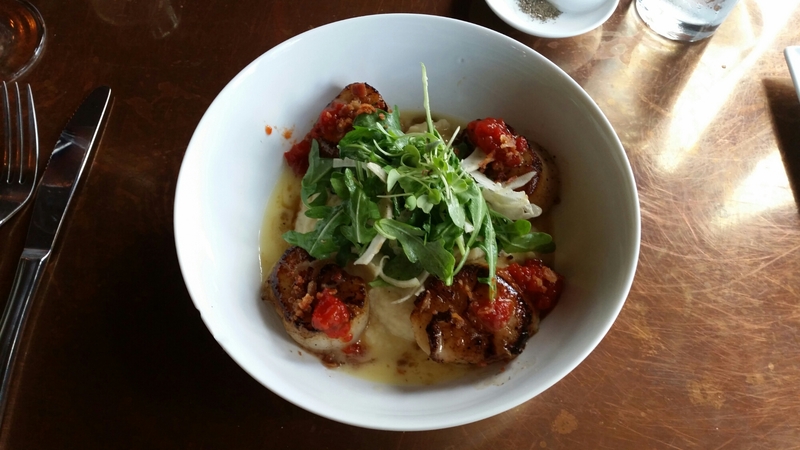 After a lot of internal debating, I finally ordered the Pan Roasted Scallop special with parsnip puree, fennel arugula salad, butter sauce, bacon crumbs, and tomato jam. When the waitress left, I focused on the drink in front of me, taking a serious haul of the bourbon based beverage. I had expected major peach flavor, but instead got something quite different. The peach provided only a hint of fruit background, the bourbon kept it’s full flavor, and the combination smoothed it all to a light, oddly refreshing cocktail which would work both for nights of heavy drinking or as a single summer sipper. It was very unique as I’ve had many bourbon Manhattans and this one was different than any of them. 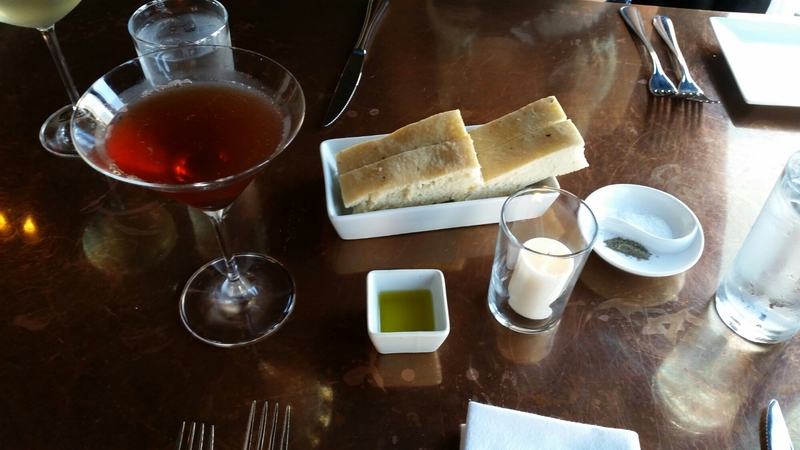 I continued downing my drink and nibbled on some delicious focaccia, momentarily forgetting we had more food on the way. Despite my obsession with the whiskey and bread, when the salads came to our table, I dug right in. I was a little nervous about the blue cheese as I’m not a big fan, but picked some of it off and felt it would be perfect after that. I took a few bites. The fresh lettuce and tomatoes were boosted with great flavors from the onions, bacon, and dressing. It was a really nice take on a traditional wedge. The one change I felt would have made it even better was a little more dressing. I thought that would have added the ability to better blend the cheese into the plate and given it a creamier taste. It was still nice to get plenty of crisp vegetables leading the pack, but next time I might suggest denser drizzle when ordering. My wife’s salad was excellent with no shortage of parm a beautiful punch from the creamy garlic. We kept eating until we were finished our greens and then waited for the main courses. I hadn’t had scallops in a while, so when they came out, my mouth was watering. I was pleasantly surprised at the amount of food in my bowl; the four scallops were large with a hearty base of the parsnip puree and the salad on top. The scallops were sensationally seared with the bacon, butter, and jam adding just a tiny bit of flavor enhancement. The puree was creamy and added a really nice feel to the mouth without overpowering anything else in the dish. The salad was a also good accompaniment with just the right amount of fennel not to take over and alter the flavors negatively. As I plowed through my meal, the one thing that stood out about the dish was that the scallops were truly the centerpiece and despite so many other items added to them, nothing distracted from the unbelievably plump and delicious sea cylinders of yum. The other ingredients were all easy additions and the bacon, while a stronger flavor, was used only sparingly to add just a touch of goodness. I finished and was happy to take a couple bites of my wife’s risotto which packed a deliciously loud mushroom wallop. When we were both done, we decided that a look at the dessert menu wouldn’t hurt anyone. Mrs. Portlandeater had a hankering for the Peach and Blueberry Tart, but I overruled her by going with the Cheesecake “Crème Caramel”. 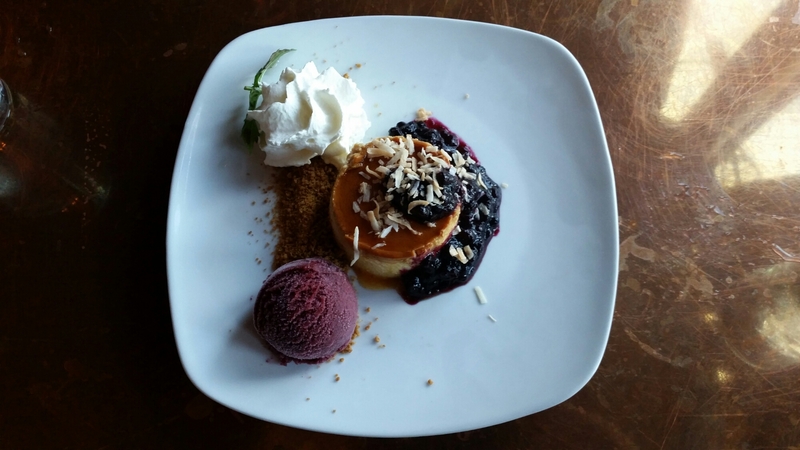 With blueberry compote, coconut, graham cracker crumbs, and blueberry sorbet, it sounded like a winner to me. Fortunately, it came out after only a few minutes. The little cake was topped with the coconut and compote. Along the side were the sorbet, crumbs, and whipped cream. Our forks touched down on the cheesecake at the same time. It was beautiful with a bit of burnt caramel and the standard creamy, cheesy awesomeness a great cheesecake offers. The blueberry and coconut allowed for different and interesting flavor combinations and the graham cracker threw in a traditional, but nearly essential element. I actually preferred the sorbet on its own, though I loved its super strong blueberry flavor that mimicked eating sweet frozen blueberries. It all worked together, but there’s no doubt the cheesecake itself was the leader of the plate. A few minutes into the dessert, it was gone forever and we were done. The bill came to $100 and based on quality and portions, it was well within the realm of reasonable. After all the eating, it was clear that MK Kitchen has a particular talent for taking a central ingredient and altering it only slightly to play up flavors both delicate and intense. While certain ingredients can distract or hide the main player of a dish, MK avoids that completely, instead allowing the diner to revel in the beauty of natural and intended flavors while throwing in notes that create a well-played conglomeration of sensory superlatives. They do it right and there’s plenty of people who seemed to already know that as the restaurant was nearly full when we left. I recommend you take the time to head to School St. in Gorham and taste for yourself. I also suggest trying the lobster cones I passed on. Those gorgeous treats made their way past our table multiple times and will be my starter on our next visit. This entry was posted in Portland, ME food on August 8, 2016 by peterpeterportlandeater.